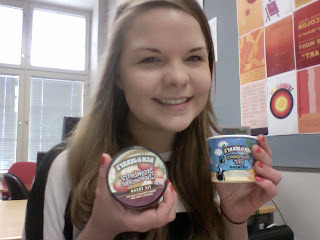 Today it was 'free cone day' at Makuuni for Ben & Jerry's ice cream! I couldnt get anyone from school to go with me -they were busy with lectures/workshos since its International Week, but anyways I went alone and stood in line with all the kids from the highschool next door. haha :D BUT it wasnt just 1 cone that they gave, I got two mini-tubs! Strawberry Cheesecake & Coconutterly Fair. yum yum yum.